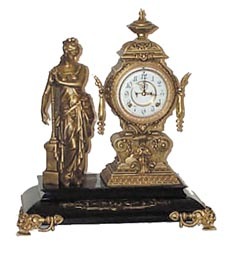 Ansonia Clock Co. figure clock, "Music", ca 1894. Black enameled iron base , new gold in the etchings. Other parts of the clock are finished in Barbedine Verde, a golden bronze color. Professionally refinished by the best, Bruce Baziluk. Not to waste too much of your or my time, I\'ll just say, it is perfect. Ly-Ansonia No.502.